According to Father Jenkins, Indiana’s subsequent provision of $42 million in matching funds to support development plans in the Michiana region was only one of the fruits of collaboration between the University and the communities surrounding it. Father Jenkins observed that much of the new construction has taken place outside the Notre Dame campus. He mentioned particularly the Turbomachinery Laboratory, which will open Tuesday (June 9) in Ignition Park in the old Studebaker corridor; the second phase of Innovation Park, a new, three-story, 40,000-square-foot facility immediately south of campus, built to accommodate 25 to 30 startup companies; and the new Women’s Varsity Rowing Boathouse on the St. Joseph River. It was also mentioned that planning is underway on the second phase of Eddy Street Commons in the Northeast Neighborhood. 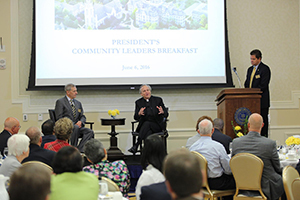 Notre Dame’s executive vice president John Affleck-Graves and Hugh Page, dean of Notre Dame’s First Year of Studies, also spoke at the breakfast, and Jan Cervelli, the new president of Saint Mary’s College, was introduced as a special guest. Originally published by Michael O. Garvey at news.nd.edu on June 06, 2016.